Easy Sorbet RecipeI'm looking for an easy sorbet recipe. 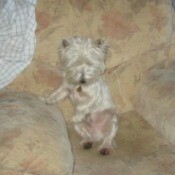 Maxwell (West Highland Terrier)Maxwell is a 4 year old Westie. He likes to cuddle, chase next doors cat, and watch TV.